“That's not true,” I said. “ I like hundreds of thousands of other Americans can travel all over America while I'm not home or while on vacation and sleep and cook-anywhere in America. But when I am in Venice, I don't need to sleep in my motor home. I have two friends close by that I can sleep over anytime I am in town. The officers seemed perturbed that I was answering their questions with facts and was talking to them like human beings in intelligent conversation. I asked them at least three times “What do you want me to do? Do you want me to leave? They ignored my question and turned to each other and said , “He's not getting it.” I said, “Officer, I am a normal guy doing farmer's markets. I am not doing anything illegal. I am just enjoying my life visiting friends and doing shopping. I haven't done anything wrong. “What you are doing is illegal,, I said, let me go please or I demand you call the Sheriff please. What you are doing is illegal.” They laughed at me and closed the door. I was sitting in handcuffs for close to two hours. They said I would be able to bail myself out in a couple hours-but said the computer was down so they couldn't process fingerprints. 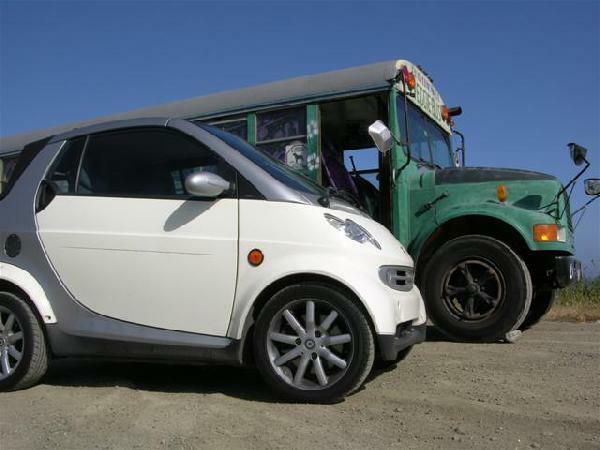 I was one of the first in California to have a bio diesel Bus and first to have a smart car too! This is clearly an example of an overzealous municipality and police department infringing on our rights. This man was parked, in a legal parking spot, in his vehicle at 1pm in the AFTERNOON, not camping, sleeping or living in his vehicle. He had not stayed the night there. If the vehicle had been a fancy $500,000 motorhome, with a rich daddy driving it who had pulled over to make lunch while on the road, would the same treatment and arrest have occurred? I doubt it! I work in the real estate field and am on the road often. It is common for me to pull over to the side of the road and talk on the phone, use my laptop, eat my lunch or occasionally take a quick nap,,,might I be the next person arrested?? If I am in my new Lexus is it OK? If I am in a rusty old vehicle do I have less rights? Does one who drives a motorhome have less rights that those driving vans or cars? This is a slippery slope of rights infringements instituted by the "elite" against the powerless. What the makers of these laws seem to have forgotten is that what makes this country so great is the rights of ALL of its citizens. This arrest has cost this man approximately $2000 so far. 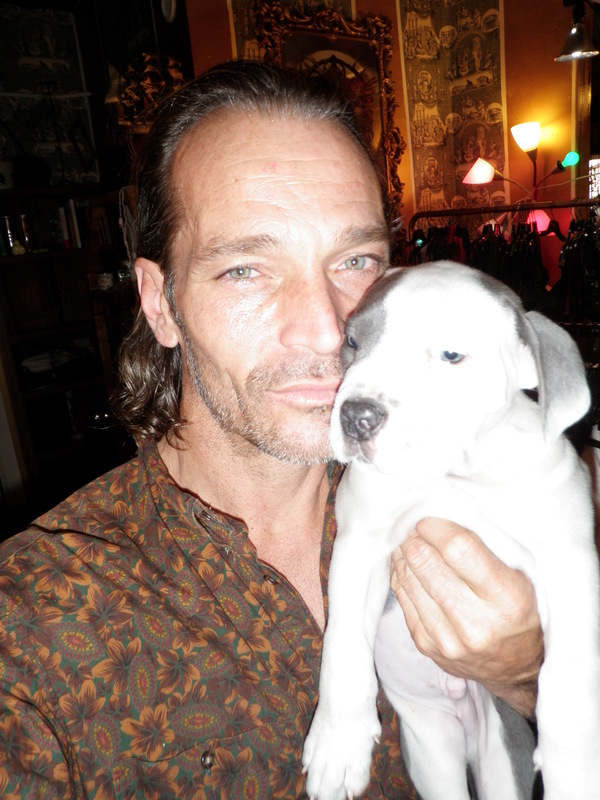 In addition, he lost almost 2 full days of his life being incarcerated, reclaiming his vehicle and his dogs. Is this really the way we, as a society, wish to be governed? I encourage you to share this information with others and to take action. Write your councilman to rescind this unfair, biased and probably illegal law. Personally I hope that Mr. Pearson gets good legal representation and sues the daylights out of the city for what was done to him and his dogs....and who pays for all of this?? of course, we do. We paid to have the law passed, we paid to hire the 21 enforcers, we paid to incarcerate this man and now we will probably pay to make him whole again after this gross infringement of his rights. Who is going to be next? You...me??? Michel@Petulli.com 2503242992 2941 oak st Chemainus b.c. The shadow government must be happy that those wanna be elitists mall / beach cops have a limit on the iq entrance exams now.It makes for easy tyranny as the enforcers of the control freaks do not have the "where with all " or the brains to use for discernment between a criminal and a honest human being . I have known mr Shiloka for well over a decade , and altough he is a free thinker a farmer , a dog breeder,a trustworthy friend one thing he is NOT is a criminal.In fact the only criminals i see here is the police officers and their handlers for not properly trainig their officers in the first place. These cops were placed in Venice to remove any funky looking van, RV, or converted school bus. Because Venice Beach is fast becoming just another gentrified beach town. The local city councilman Bill Rosendahl is siding with NIMBYs and haters who want to drive the funk out of Venice. Only super clean want-a-be funky people that support a fascist police state allowed! Another pretend progressive. OK to support equal rights for LGBT people as long as they have enough money and are not homeless - ey Bill? G-d bless you for sharing your story and making it through this terrible ordeal. Unfortunately, it's probably going to get worse before it gets better in Cali and all over the country. The gov't want's mindless consumer zombies to keep buying and the rest of us to get used to a militarized Police State that they have been working on imposing for a long time. People aren't just being arrested and jailed, some are doing 6 month federal prison sentences for b.s. charges and judges are given a free hand to do what they want until they die, retire, or are impeached [very rare & hard to accomplish]. While in prison or in a jail, the gov't and certain corporations are making a mint off of their inmates in at least 4, possibly 5 or more continuous income streams. They will continue seizing, arresting and imprisoning citizens in this country until stopped. It's going to take a lot of people with a well heard voice to shake up and wake up Congress and the rest of Washington. The fact that you expressed your self the way you did probably saved you from being locked up longer. Be strong and keep fighting them and spread your love wherever you go. You sound like you are involved with a lot of good things. Keep pushing good ideas and energy forward and don't let these closed-minded gov't puppets get you down. This is terrible...I think there is some real crime for the LAPD to go after. Sorry you and your puppies had to go through this.